The Department of Homeland Security has moved to waive a stunning list of environmental regulations for the construction of Donald Trump’s stupid border wall. You know, the same one which depending on how lit the president happens to be at any given moment, he has promised would be between anywhere from 30 to 65 feet tall and possibly covered in space-age solar panels. ... The National Environmental Policy Act, Endangered Species Act, Clean Water Act, Clean Air Act, National Historic Preservation Act, Migratory Bird Treaty Act, Migratory Bird Conservation Act, Archaeological Resources Protection Act, Safe Drinking Water Act, Noise Control Act, Solid Waste Disposal Act, Antiquities Act, Federal Land Policy and Management Act, Administrative Procedure Act, Native American Graves Protection and Repatriation Act, and American Indian Religious Freedom Act. Trump has struggled to fund the entire wall for a number of reasons. Congressional Republicans are averse to spending money on anything, the underlying concept is transparently unworkable and Mexico has refused to pay for it. But as ThinkProgress noted, the three-mile section in question was funded by the fiscal year 2017 budget resolution passed in May as a sort of consolation prize. The DHS made explicit they were enacting Trump’s will by waiving the regulations. 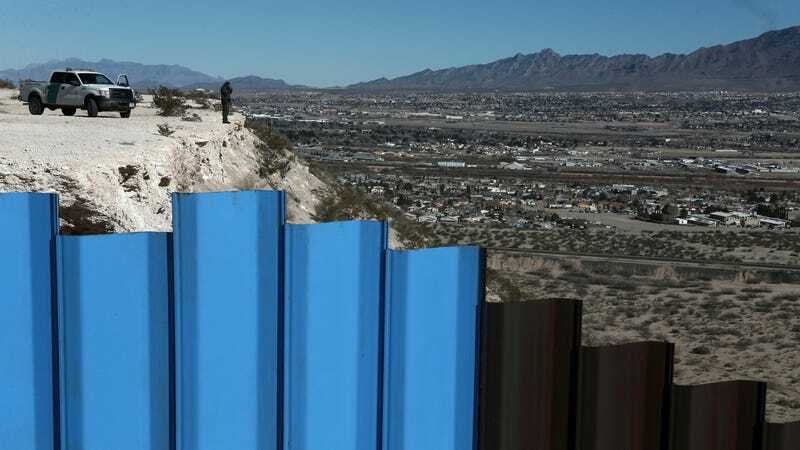 “The Department is implementing President Trump’s Executive Order 13767, Border Security and Immigration Enforcement Improvements, and continues to take steps to immediately plan, design and construct a physical wall along the southern border,” the advisory said. Federal construction projects generally need to check off a number of environmental safety guidelines. Trump has wavered on the wall’s length, which could be between 700 and 1,900 miles; depending on what gets built, over one hundred endangered species could find their habitats disrupted or destroyed. There are many animals that naturally migrate across the border each year, such as the black bears in West Texas, or the pronghorn antelope across the Southwest. Interrupting these natural movements could have devastating effects on these species on both sides of the border. Similarly, the border wall will trap populations that continue to move north in response to a warming and changing planet, potentially killing individual animals and populations or resulting in the future extinction of entire species unable to find habitats south of the border to survive. A 683-mile stretch of wall authorized by President George W. Bush already disrupted mountain lion populations, and heavy security has made it difficult to study the effect on wildlife. Beyond the ecological impacts, the waivers would allow construction to ignore rules intended to protect against poisoned groundwater and grimy air, noise pollution and destruction of native sites. A three-mile stretch of Trump’s dumb wall is bad enough, but the obvious disdain for decades of environmental rules suggests the full 1,900-mile wall might get the same treatment if it is ever funded. While the administration might insist there is some sort of crisis brewing on the border necessitating the waivers, there’s just not. Evidence is widespread more immigrants are already returning to Mexico than moving north, and that the wall would backfire by trapping seasonal workers in the US. Even that is generously assuming Trump’s wall is motivated by some kind of genuine concern for law and order and not just placating racists—and if you believe that, enjoy your toxic fumes and dead wildlife.